This is a sponsored post in partnership with Morningstar Farms. Mmmm, you’re lookin’ at one of my all-time favorite indulgences, right there. 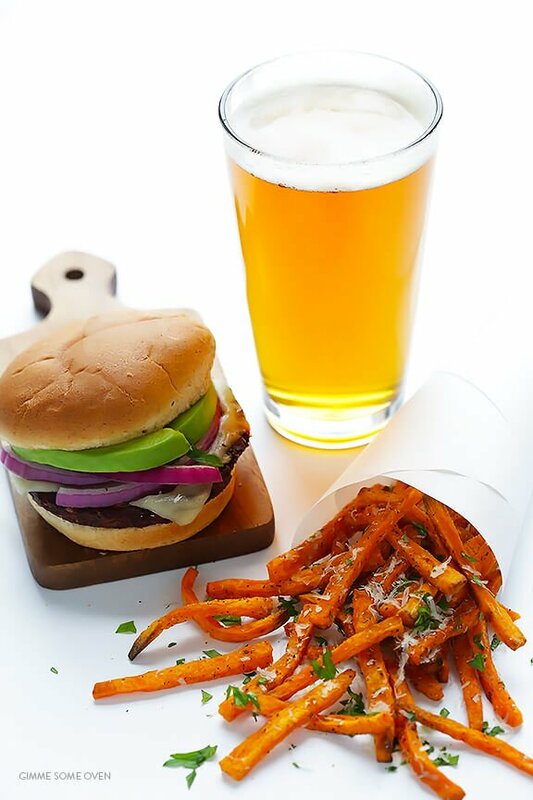 LOVE me some sweet potato fries! 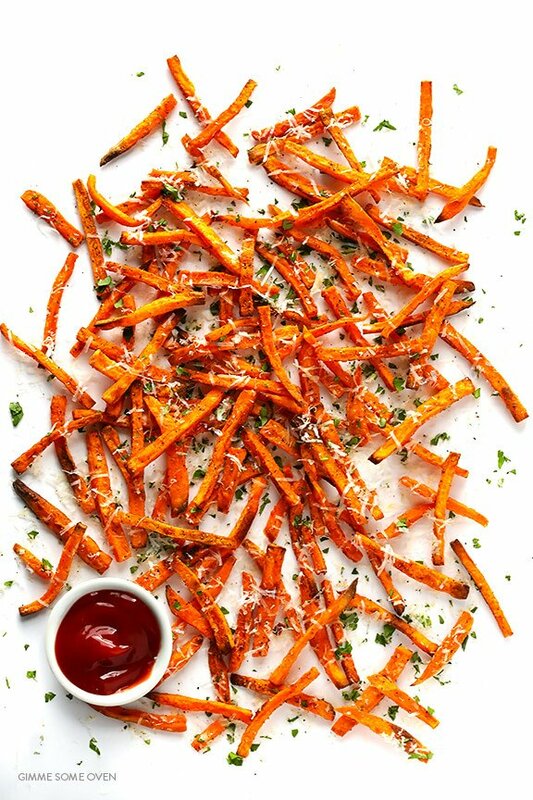 Actually, the last meal I made with these sweet potato fries ended up being a wildly delicious, healthier, vegetarian success. I was randomly craving a burger and fries. But being that I don’t really eat hamburger and wasn’t feeling like a batch of greasy restaurant-style white fries, I decided to whip up a simple alternative at home. 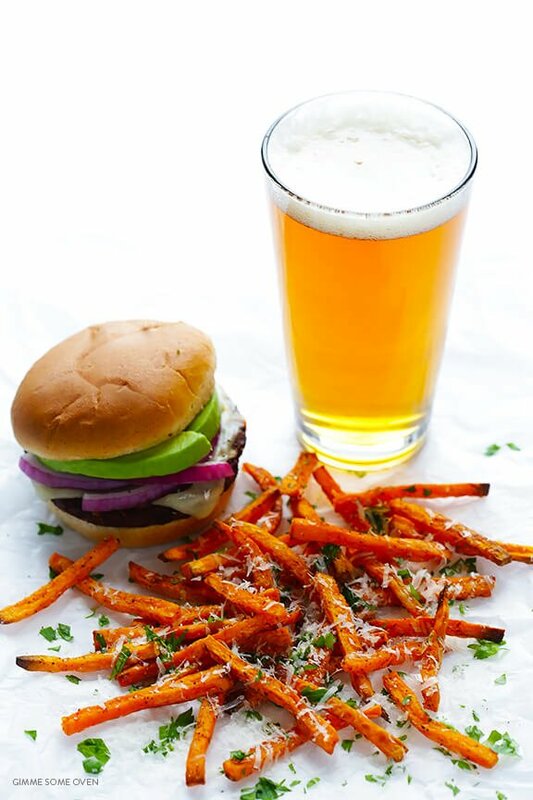 I tossed one of my favorite black bean burgers in a sizzling skillet, cut up some sweet potatoes to bake up and tossed them with extra Parm and parsley afterwards, and then cracked open a cold IPA from a brewery just down the street. And it may have actually been one of my favorite burgers and fries night…ever. I mean, just look at ’em! 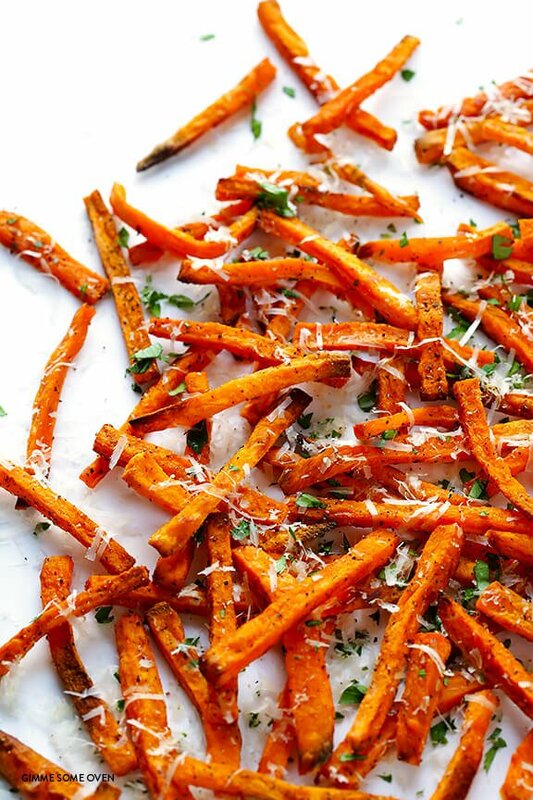 Delicious salty and sweet fries, topped with oodles of fresh Parmesan and a little parsley, and baked up to crispy vibrant perfection? I’ll vote for those over “regular” fries any day. Plus, with all of the vitamins and nutrients packed into sweet potatoes, you can feel genuinely good about eating them! But back to these fries…here’s how to make ’em! Begin with some fresh sweet potatoes. You can either peel them or leave the skin on — your choice. But the key is how they are chopped. In order for baked fries to cook evenly, they definitely need to be the same size and thickness. I find that about 1/4-inch thick makes for the perfect balance of crispy-on-the-outside and soft-on-the-inside with these fries, but feel free to experiment. Then toss them in some vegetable oil (or any high-heat oil), along with some salt and pepper and garlic powder. And if you want to give them a little heat, feel free to toss in a few pinches of cayenne. Then spread them out in an even single layer on a baking sheet, and roast them up to crispy perfection, turning them once or twice during baking so that they cook evenly. 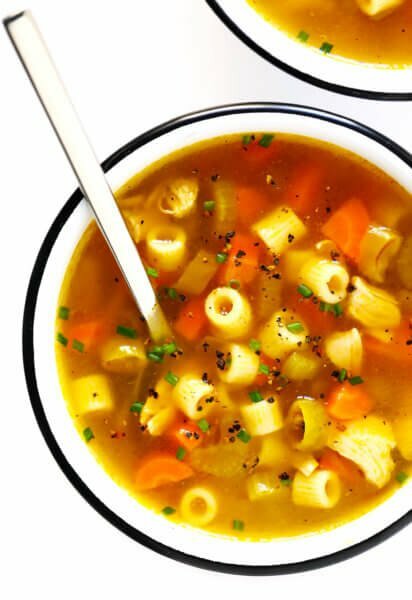 After baking, toss them immediately with some freshly-grated Parmesan and parsley while they are still hot, as well as a little extra salt and pepper if needed. 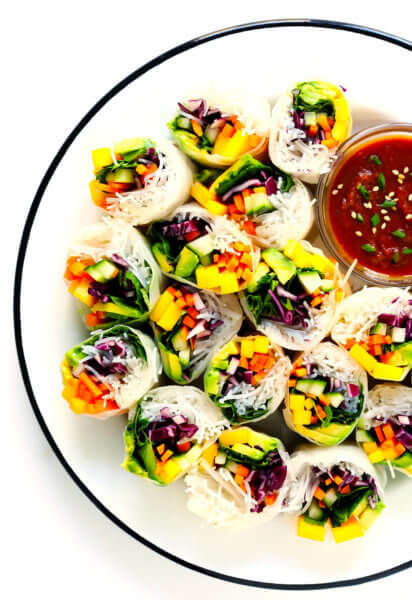 …and this delicious and healthier side is ready to go. 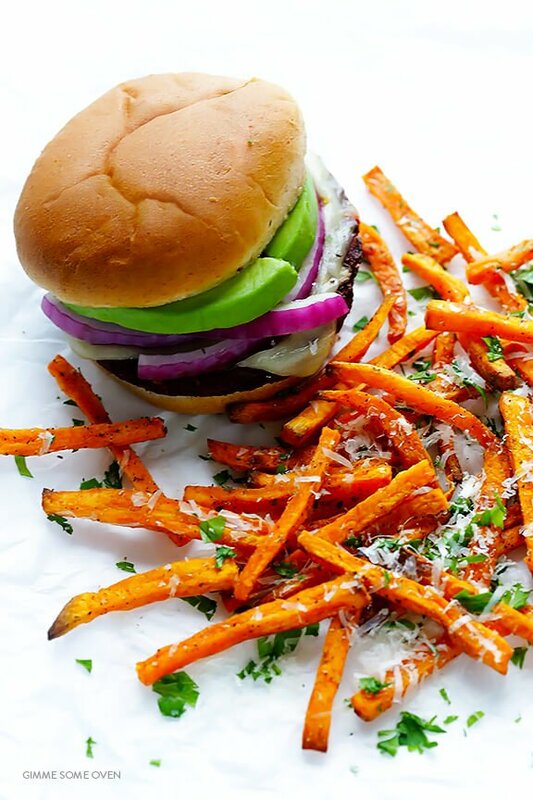 Definitely the perfect meal for a Meatless Monday, or any day that you’re looking for a healthier alternative to traditional burger and fries. Enjoy! 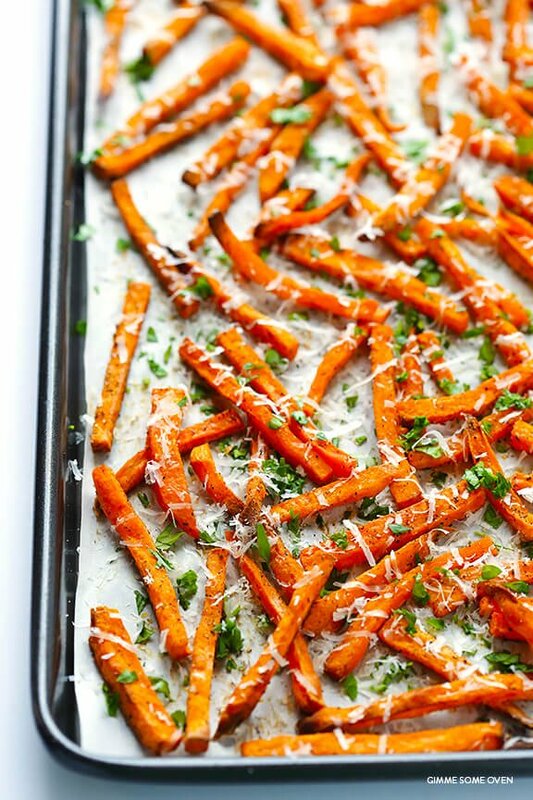 These Parmesan Baked Sweet Potato Fries are quick and easy to prepare, made healthier in the oven, and irresistibly good! Cook for 15-20 minutes, flipping the fries once or twice during that time so that they cook evenly. (Cooking times will vary based on the size and thickness of your fries.) Remove once the edges slightly begin to brown and fries begin to crisp. 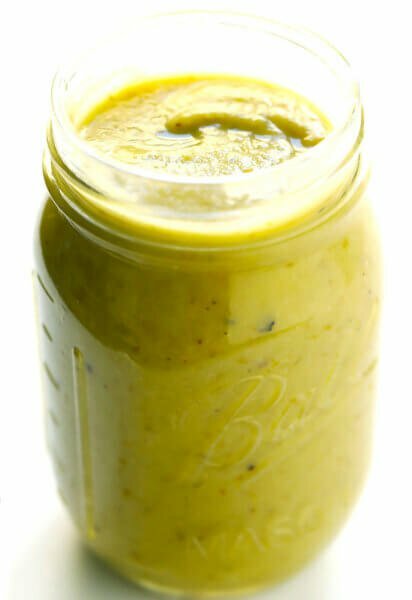 Immediately sprinkle with Parmesan cheese and parsley, and toss briefly to combine. Serve warm. This is a sponsored post in collaboration with Morningstar Farms. I am partnering with them to create some delicious vegetarian recipes, and all opinions are my own as always. Thanks for continuing to support the brands that make this site possible! 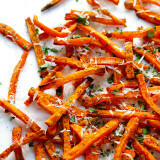 I love sweet potato fries, I’ve never made them with parmesan. These sound (and look) awesome! Thank you, Sam, we hope you enjoy these! Literally let out an audible OMG when I saw this one. One of my favorite fries are of garlic parm variety, and I never thought about doing this with sweet potatoes until now. Thanks, Amanda, we hope you like them! I love sweet potatoes! Especially baked… :) yummy! I am so excited about this recipe. 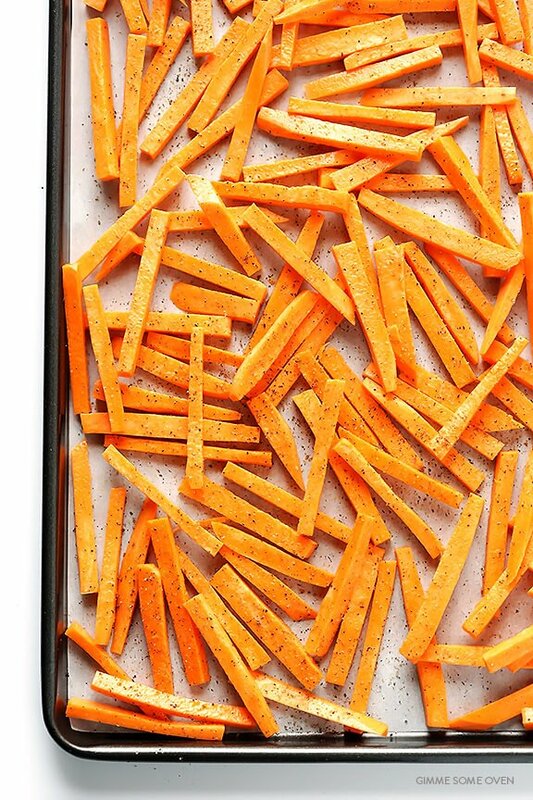 I have been looking for new ways to dress up our baked sweet potato fries and this is perfect. thank you! Thanks, Abby, we hope you enjoy these! These looked so good! I can’t wait to try making them myself. Thank you, Mimi, we hope you like them! I have a handful of sweet potatoes staring at me right now that are begging me to transform them into these delicious fries. Thanks so much for the inspiration! You’re so welcome, we hope you enjoy these! Thank you, and oh my gosh, what a fantastic idea, we hadn’t thought of that! YUM! How would I flip them while they are hot in the oven? You just use potholders and a spatula, and toss them in between baking. We hope you enjoy! I made these tonight but they didn’t get crispy. Followed directions and cooked them longer than 20 minutes. They tasted great though. Hmmm, different ovens sometimes crisp up fries differently. If you try them again, feel free to crank up the heat another 25-50 degrees (keeping a close eye on them, because they will cook faster). Or you might also toss them in a little more oil. Best wishes! made these tonight-SO delish! They did not crisp up as much as I’d hoped in the time I gave them (20 min), so I just turned the broiler on HI & watched em like a hawk & tossed in between, they turned out great! Next time I’ll take your advice & toss em in a little more oil & cook em a little longer (I had everything else done and didn’t want it all to get cold). Thanks so much for this recipe! Thanks for giving these a try Nicole, we’re glad you enjoyed them! These look wonderful! Any tips for slicing the sweet potatoes without cutting your fingers off? Haha, the only reason I haven’t tried these is because they’re so hard to cut! Hi Trista! Just make sure you’re using a good, sharp knife, and protect your fingers by making a claw while you slice. We hope you enjoy these! These are so ridiculously pretty! Thank you, Amreen — we hope you enjoy them! Have tried them in an air fryer? If so, how long & temp? Made these but doubled the cayenne. Fantastic!